This is just a maintenance release containing only fixes and improvements. This week we released an update for SQL Enlight and SQL Enlight for SSMS version 1.9.3.733. The new rules selection dialog adds some useful filters and allows the rule parameters to be set in a single step. 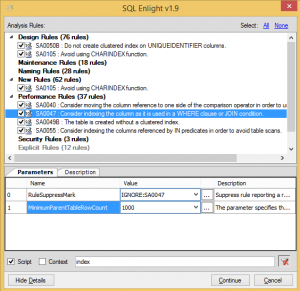 Download SQL Enlight and SQL Enlight for SSMS here. We are very happy to announce final release of SQL Enlight 1.9.3.727. We did a several fixes and improvements to the tool in this release. You can download and try the final release of SQL Enlight 1.9.3.727 here. We also released a new special edition of SQL Enlight focused on the T-SQL static analysis – SQL Enlight For SSMS. The new edition includes all SQL Enlight analysis features as well as improved integration with SQL Server Management Studio. The SQL Enlight For SSMS is developed as a part of the Red Gate Ecosystem Project and uses the advanced integration framework provided by the ecosystem. You can download and try the new edition here. 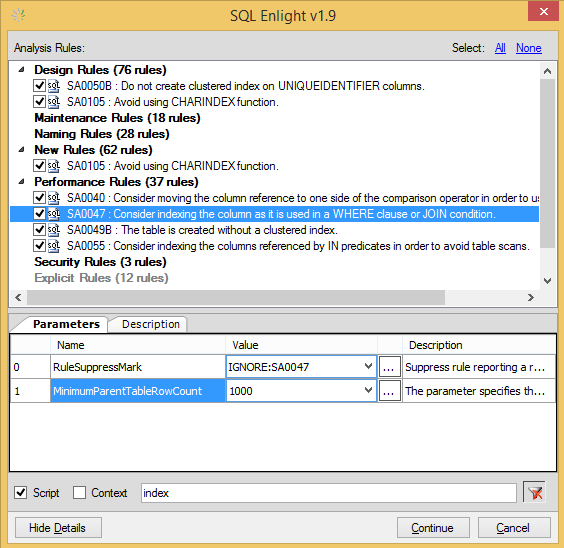 Another beta version of SQL Enlight is available for download here. If you find any issues in the new version, please report them using our support email. We are very happy to announce that there is a new update of SQL Enlight which is now available for download. The version of the update is 1.9.3.690 and it is now in beta. Your feedback and comments will be of great help for the final release. Thank you! We are very happy to announce the release of the SQL Enlight 1.9.2.671 update which can be downloaded here. Along with the fixes and improvements, this release adds the support for SQL Server 2012 T-SQL syntax and integration with SSMS 2012 and Visual Studio 2012. That’s not the end with version 1.9 updates. Soon we are going to make available another which will add several new rules to the current set and will also add some improvements to the current Visual Studio integration. As a final, we would like to give special thanks to Direct Supply team for their contribution and great feedback during the development of the current and the next updates.